Although the First World War technically took place in the same century, World War II was undoubtedly the war of the 20th Century. Unlike the earlier conflict, which was a culmination of events deeply rooted in the 19th Century, WWII fully reflected the technological, political, and cultural trends of the century in which it took place. One of the most telling examples of this was the propaganda. The ministers, commissars, and admen who governments relied on to sell their war employed every modern technique they could to convince often skeptical populations that the carnage and destruction that filled their streets and newspapers was just, under control, and absolutely necessary. And while they increasingly turned to modern technological mediums like radio and television to transmit their messages, it was the propaganda poster that was the most effective tool of governments to inform, seduce, and cajole their populations. Now, they are potent, and often beautiful, artifacts of the last time the entire globe attempted to tear itself apart. Here are ten of the best World War II propaganda posters. Perhaps one of the most recognizable propaganda posters of any time, “I Want You for U.S. Army” was actually commissioned for WWI. Based on an equally iconic British recruiting poster, this indelible image was so effective that it was also extensively used in the Second World War. Even to our 21st Century media-savvy eyes, it isn’t hard to see why so many young men heeded its call. The stern, paternal face of the national icon Uncle Sam seems to be staring right into your soul, no matter which way you look at the poster. The appeal to honor and duty, not to mention the slightly sinister undertone, was enough to convince countless men to willingly sign up for a tour in Hell. If that isn’t an effective piece of propaganda, what is? 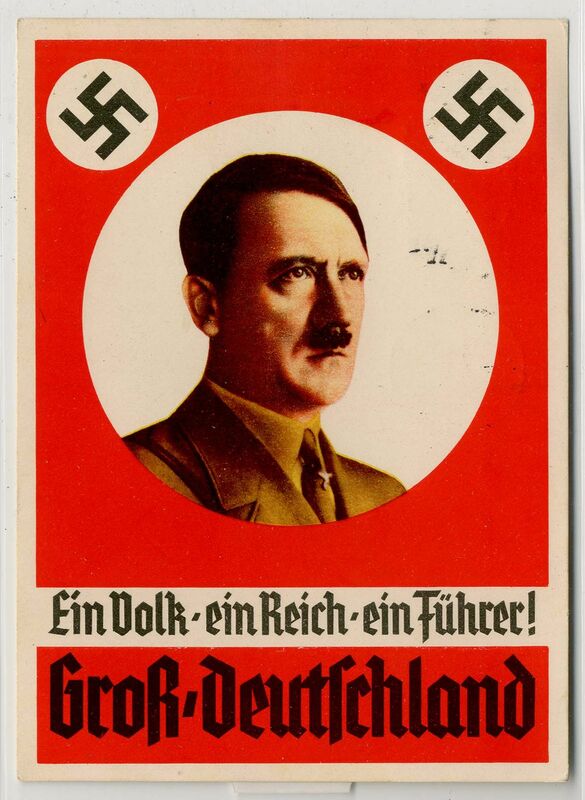 While America used a fictional figure clad in the colors of the flag, much of Germany’s propaganda featured the very real, very living Adolf Hitler. Hitler didn’t invent fascism or the cult of personality that fueled it, but he certainly perfected it. Not a particularly attractive man even by the standards of his day and nowhere near the Aryan ideal he so often extolled, Hitler nevertheless sold the German public his image over and over again as the unequivocal symbol of all their hopes and ambitions. A classic example of this is “Ein Volk, Ein Reich, Ein Fuhrer!” Its simple message- ‘one people, one empire, one leader’ in English, was used throughout lands conquered by the Germans to inspire allegiance and fierce pride in the ethnic Germans who resided there. Unlike Uncle Sam’s penetrating gaze, Hitler here is looking off to the side, to a future where every German is master of every land. A powerful image. And an incredibly effective one. While Hitler and the Nazis were busy convincing Germans of their destiny, the British government was desperately trying to convince its citizens that their nation wasn’t about to be utterly destroyed. In 1939, most Britons feared that in the very near future millions of German soldiers would be landing on their beaches. The government, the only major power that was currently at war with Germany, knew that while Germany was currently pursuing its other ambitions; eventually it would turn its full fury and attention to the United Kingdom. To keep up morale, the British Ministry of Information commissioned a series of posters to remind citizens of their national character. The most iconic of these was “Keep Calm and Carry On.” A simple message in bold type underneath a picture of the crown, it captured the core of the British identity. Funnily enough, even though millions of copies were printed, it was never widely displayed during the war. It was only recently rediscovered and popularized. It still remains an amazing example of how a few words and a simple image can capture the spirit of an entire nation. Once the Russians entered the war, they produced a recruiting poster of their own that rivaled Uncle Sam’s call for soldiers in popularity and effectiveness. Instead of using a steely eyed father figure to recruit soldiers to their patriotic duty, the Russians used a woman. With a gaze just as penetrating as Uncle Sam’s, Mother Russia stared into the souls of tevery young Russian and reminded them of the mothers, grandmothers, wives, and sisters they had lost in the brutal German invasion of their homeland. By appealing to the intense love of country that most Russians shared, this poster galvanized the desire for revenge that Russian men felt. And it kept them warm as they began their savage counterattack west. To further this idea, and to convince the people of their new colonies to accept the reality of Japanese rule, they created the “Rise of Asia” poster. Depicting a noble looking Japanese soldier throwing off the chains of European rule and standing over defeated caricatures of Britain and the United States, it was meant to signal that a new order was rising to free the long oppressed peoples of Asia. Unfortunately for the Japanese, their actions on the ground didn’t convince anyone and they faced bloody resistance in almost every country they attempted to enfold into their empire. One of the key features of propaganda during wartime is its attempt to appeal to the basest of human emotions and ideals, whether it’s noble human desires like justice and freedom, or less noble ones like hatred and fear. One of the most effective tools for stirring these evil thoughts and drumming a populace into support for a war is good, old fashioned racism. Used by armies since the dawn of time, the technique works because it casts the enemies as something less than human; a scourge that needs to be eradicated before it destroys everything we love and cherish. There are countless examples of racist propaganda posters from World War II, but one of the best examples was the American poster “This is the Enemy.” Shocking by today’s standards, it shows a grinning caricature of a Japanese soldier with slanted eyes and simian arms carrying away a naked white woman while others swing from their necks in the burning background. It is a dark, unnerving image. Perhaps the most frightening thing about the poster is that it wasn’t used to create an image of the Japanese, but to reinforce one already widely and unquestionably held by regular, everyday people. Racist posters were not only used to stoke hatred back home. The American poster “Be Sure You Have Correct Time” uses similar racist imagery to remind soldiers of the operational value of keeping their watches wound while in the field. With its blatantly offensive cartoon versions of Hitler, Mussolini, and Tojo, it speaks to the hatred all soldiers feel for their enemies and the lengths to which they and their superiors went to dehumanize the men they were tasked with killing. Animosity comes easy when a group is attempting to kill you and your buddies, and the armed forces knew that. Every chance they had, including in simple instructional posters, they reminded the men who fought for them that the enemy were monsters who deserved nothing more than savage contempt. Racism, of course, wasn’t the only effective way to remind members of the armed forces that they needed to maintain discipline at all times. The British poster “Loose Lips Sink Ships” takes a simple rhyme, a stark iconic image, and a slash of deep red to warn soldiers of the dangers of talking out of turn about the actions they were about to take. Soldiers and sailors often cope with the long periods of inactivity that come with military life by being notorious gossips. Unfortunately, most military plans rely on secrecy. Factor into this the fact that the major powers of World War II were planning and conducting some of the most complex military endeavors ever attempted in the history of mankind, and it becomes apparent how much damage one talkative soldier could do. Hence the prevalence of this poster and thousands more like it. A simple poster of a working woman (based on the existing character of “Rosie the Riveter”) flexing her muscles, it encapsulated the new found power of women all across America. Pressed into service in factories across the country, these women were a vital part of the U.S. war effort and for the first time in the nation’s history, became an economic force to be reckoned with. 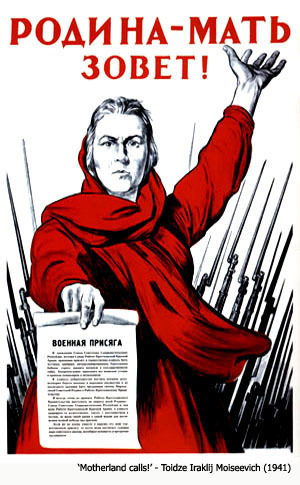 Although things changed once the war ended, the poster is still used as a symbol of female power. A power, only awakened by necessity, that would change the face of the country for generations to come. 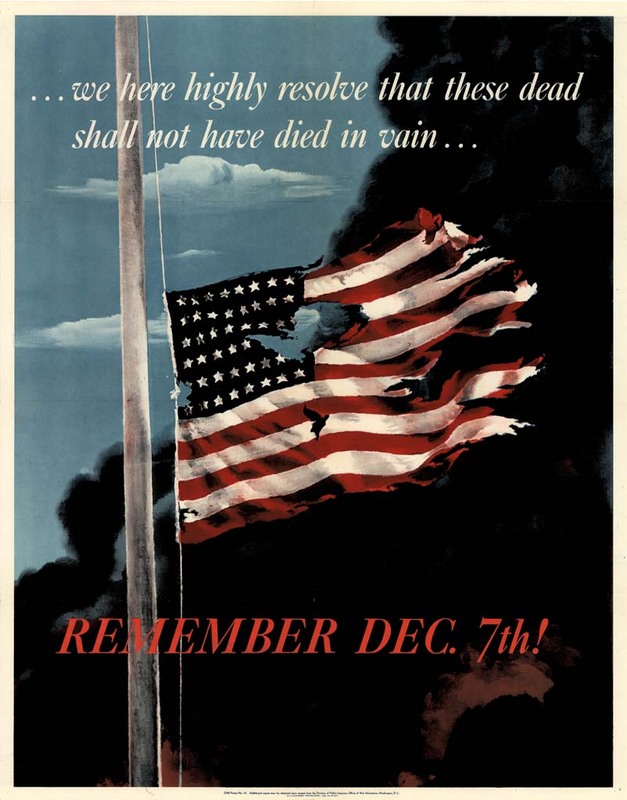 Before December 7th, 1941, few Americans felt that their country belonged in the war. Isolationism was a popular sentiment across the political spectrum, and the nation had remained almost entirely unscathed by the carnage happening on the other sides of the Atlantic and Pacific. America was happy to lease large amounts of war materials to its allies, but that was about as far as most people were willing to go. Then Japan attacked Pearl Harbor. A haunting image of a tattered American flag resolutely swaying against a burning black sky, it perfectly captured the emotion of its intended audience. And more importantly, it inspired more than one able-bodied man to visit the local recruiting office. Pearl Harbor happened on December 7, 1941, not 1942! Oops, thanks for catching that mistake. I liked the list but I would have liked to see posters that I was less familiar with than the standard American ones that i’ve seen many times before. No italian posters? This list might have been better served being a top twenty instead. Maybe I’ll do a sequel! A sequel would be great! I must say that I was fine with seeing some of the more recognizable posters on this list, such as numbers 10 and 2, because the list is titled “Top 10 WWII Propaganda Posters”, and those two are very influential; the list would be incomplete without them. Yet it has in turn turned into a different piece of propaganda but of the post 80s era. A quick point about #8, the English didn’t think they would be destroyed until 1940, specifically, after the Battle of Dunkirk, when they were pushed out of mainland Europe. “we here highly resolve that these dead shall not have died in vain” is straight from Lincoln’s Gettysburg Address. Just something that could be added to your commentary. The Keep Calm and Carry On poster was designed by the Ministry of Information during WW2 but actually, it was never used in public and only became popular AFTER the war. I have an original WW11 propaganda poster by O’Dell titled Keep Their Hands Off,with Nazi swatstika and rising sun looking for value. I have some memorabilia from ww2, that says: to hell with the fuhrer in pristine condition. I sold one of these for $15,000 USD, I found one twenty years ago in the USA, I want to sell it for more, as the buyer who bought one from me offered to pay $100,000 USD. They are incredibly rare, I paid $10,000 USD. for this poster. It’s in German.